Went to make this today and couldn’t believe I’d never posted it! For a more substantial meal I dice up some chicken breast and add it to the mix. This is a reduced fat version so you can enjoy without too much guilt! stir well, and cook for 5 min. Add another Cup of Warm Water, stir and cook 5 minutes. Add one last Cup of Warm Water (5 cups total), stir and cook for 5 minutes or until all water has been absorbed. Test for doneness, add more water if necessary. Trying this soon. Calculated WW points, I’m guessing to be 6 w/o cheese. YUM! I counted a number of years ago – it’s four as long as you get six servings out of this recipe. This sounds wonderful! I’m at a loss, however about how to measure 1 Cup of Artichokes. I’m only familiar with artichokes coming in a ball of thick, prickly-tipped leaves that you have to pull apart to scrape the edible stuff from the part at the base. What am I missing here? Thank you, Mary, Queen of the Universe. 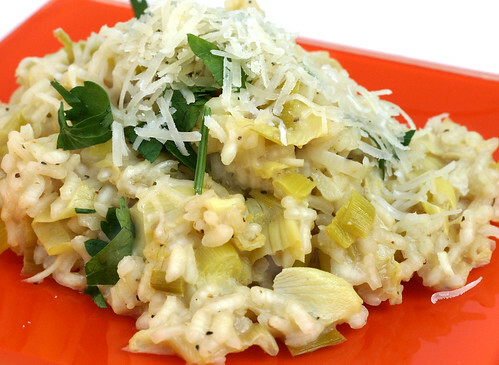 Well, we’re in the middle of a cold snap and I’m not venturing outside, so no artichokes and no leeks, but I had the Risotto with parmesan for supper tonight and it was glorious! !